In the last day Gabriel spent in the daycare he took, as it is tradition, cupcakes to share with his teachers and friends. As we mentioned in the last post, we had chosen the theme “auf Wiedersehen Regenbogen, hallo Frosch!” (goodbye rainbow, hello frog!) 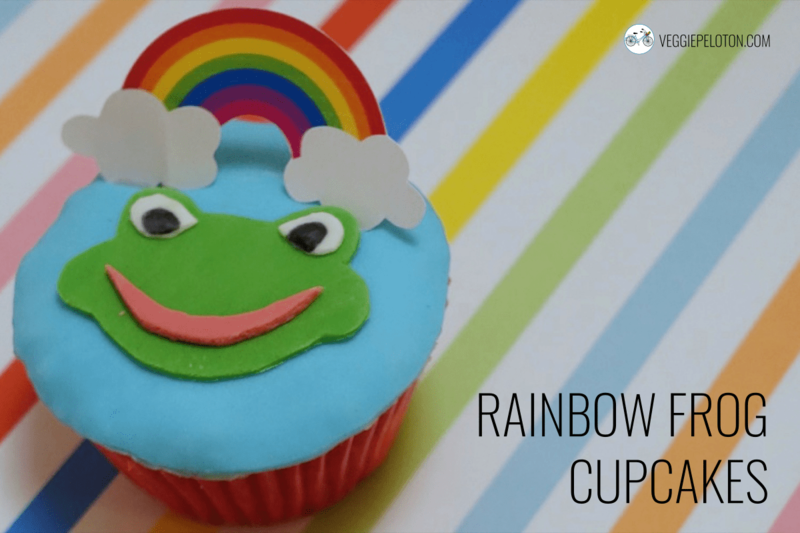 for his goodbye and for this reason we decided to decorate the cupcakes with a frog and a rainbow. We used exactly the same motives we had used for the goodbye gifts. The vanilla muffins were spread with vanilla frosting and covered with a thin layer of blue fondant on which we laid a frog (all frog parts were made of fondant, the black part of the eyes was painted with edible black ink). Because we wanted the rainbow to give a 3 dimensional effect, we made it out of paper: we taped the printed rainbow on a toothpick using white round stickers and stuck it on the cake. The cupcakes had quite a big success amongst the children and Gabriel was quite happy to have contributed to make them!